“Play ball,” the umpire calls – and there they are – two teams on the baseball diamond vying for the 2015 World Series title in a battle telecast around the globe. But there’s something special about these teams that locals from the Lehigh Valley can take pride in. They starting line-up is all wearing uniforms made in Easton. So is every other player on the field – on both teams. And many of their fans are wearing MLB replica jerseys and t-shirts… also made in Easton. This all-American autumnal rite of passage brings excitement, heavy with passion and pride, and sometimes anger and tears, to baseball fans everywhere, but especially to the folks at Majestic Athletic who have been making uniforms for major league baseball teams for decades. Watching the series with special pride will be Annamaria Verniero of Palmer Township, who manages the manufacturing and sewing area of Majestic. She has worked for the company for 45 years, way before it was named Majestic, in every segment of garment preparation, cutting, trimming, sewing, decorating. She now oversees 175 workers as they turn bundles of blanks (fronts, backs and sleeves) into official team jerseys meeting rigid quality control standards at many points. She’ll be seeing the little Majestic logo on the left sleeve of every jersey – and she’ll know deep inside they’re her jerseys. “We made them,” she’ll say to herself. She’s just one of about 600 workers at Majestic Athletic’s state-of-the-art manufacturing facility and warehouse on Newlins Mill Road in Palmer Township who turn out the on-field uniforms for America’s 30 major league baseball teams. Director of production is Chris Ryan. The bright and varied team colors blaze from the spools of thread whirring above the rows and rows of chattering sewing machines in the airy and brightly lit 350,000-square-foot facility built after Majestic was bought by Vanity Fair Corp. in 2007. “Majestic makes more than a million jerseys a year. We’re proud of our work, proud of our heritage,” said Jim Pisani, president of Majestic Athletic, VF Licensed Sports Group. Based at corporate headquarters in Tampa, he pointed out the company took root in Bangor in the 1950s when Faust and Mary Capobianco opened a small sewing mill to try to compete in the highly competitive women’s apparel industry. As the company expanded, it grew out of its original site and eventually opened nearly a dozen facilities which now are consolidated in the one building, where jerseys, outerwear and accessories are designed, manufactured and marketed. It’s a Lehigh Valley hub for major markets. Today, that business has mushroomed and become a leading provider of quality authentic team uniforms and athletic wear. 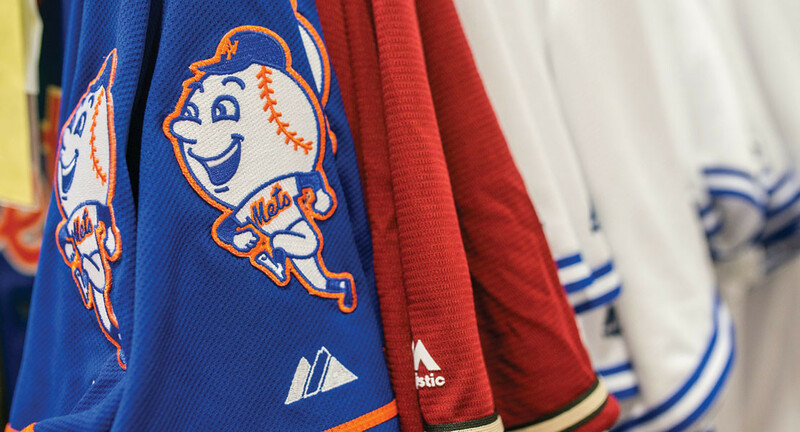 Majestic Athletic is licensed to make the official on-field uniforms for all 30 major league baseball teams. In addition, it supplies uniforms and accessories, including a vast assortment of fanwear, for the NBA, NFL, NHL, Little League, Harley-Davidson and many major universities and colleges. Majestic jerseys are now worn by the 30 teams and thousands of fans,” he said. Still, the jersey continues to evolve and the most recent version is made with a CoolBase fabric, a cotton/polyester combination. Pisani stressed research and development play a huge role in satisfying the players needs. “It’s really a collaborative effort,” he said, claiming the licensing is the result of a seamless partnership and mutual trust established over the years. Todd LaBar, marketing coordinator at the Easton plant, said every year the company sends tailors to spring training to measure the players for their custom-made uniforms. Also taken into consideration are the players specific preferences; for example, a player may want slightly baggy pants while another wants fitted ones. The measurements are kept on file and extra uniforms may be made during the season. “Certain players, such as catchers, usually require extra uniforms because they tend to get dirtier,” LeBar said. And then, there’s the inevitable trade – and Majestic’s operation is nimble enough to provide the appropriate new uniform quickly. The plant is divided into three areas. In the first, bundles of just-cut blanks, the individual parts of the jerseys, are passed to the sewing team with individual sewers bending over separate tasks. In a great mass of colorful activities, some workers sew, some work on trim, some operate embroidery machines, some put the logos on the shirts. The jerseys are pressed and hung in plastic bags, then boxed and moved to the giant warehouse and shipping area with its ranks of shelves which can be adapted to the size of the inventory. The third area accommodates the graphic arts department and silk screening operation for fanwear. Because sports is seasonal, the product flow varies and often a second shift is required. And then, there’s always increased demand for certain jerseys after a special event like an All Star Game, MVP or a no-hitter. Not to dismiss World Series heroes. Whoever wins this year’s series, Majestic will be all geared up to turn out and distribute replica jerseys of the winning team. They’ll be on store shelves within a day or two of that champagne-dousing moment at the ball park.